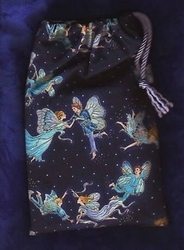 Wide Tarot Bags - Gossamer Fey Wide Tarot Bag - Tarot Bags, Tarot Cards, Cloths, & More! Dancing, swooping, and flying fey in aqua, periwinkle, and teal translucent dresses and gossamer wings frolick across the surface of this navy-colored fabric. Each scene is presented against a star-filled night sky. Shiny metallic gold outlinings highlight each figure on this magical fabric. 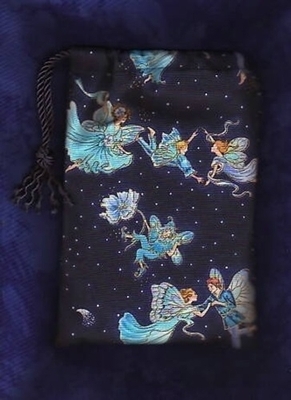 This bag makes a perfect home for a tarot or oracle deck that illustrates the fey world or a deck that could simply benefit from a little faery protection while at rest. Size and Fit: The Wide bag measures 5-3/4" W x to 8-3/4" H. It fits any of the following decks: Froud's Faeries Oracle, Fairy Ring Oracle, or Healing with the Fairies Oracle Cards--as well as any similarly sized decks. Of course, it's a great bag for the Oracle of the Dragonfae too and the guidebook will even fit inside with the cards.